The dictionary definition of vision is, “the faculty or state of being able to see.” The Strong’s definition of the word used in the verse above is, a mental sight. Over the past few months, my vision for this blog has floundered. Coming up with post ideas has been a struggle, and too many times I’ve decided to just ignore the fact that it was time for a post. After talking with a friend about my frustration concerning this trend, I realized it might be a good idea to step back and redefine the purpose of TIO. 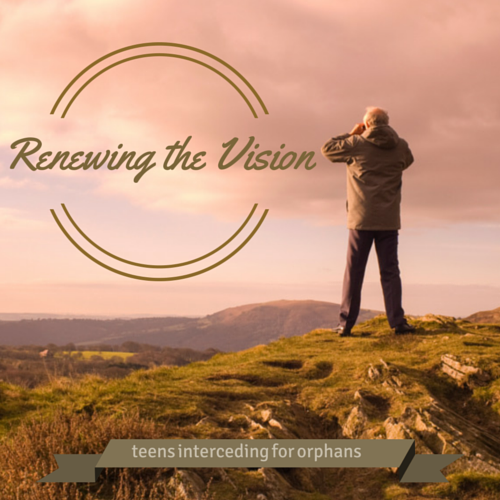 When I first started this blog, I wanted to offer teens and young adults a resource to find ideas on how they could become involved in orphan care. This stemmed from my own frustration that most opportunities seemed geared for adults, and I had struggled to find such opportunities myself. This is still a huge goal. Many opportunities are listed on the Ways to Help page. Finding a steady stream of involvement ideas to post about has proved challenging, but I’m hoping to spend a little more time finding and sharing them with you guys. One great way of finding ideas is to share what other teens are doing. Because of this, I’m hoping to step up the quantity and consistency of Teens in Action posts. My goal is to post one of these projects each month. If you or anyone you know of is working on an orphan care project, PLEASE tell me about it. Two readers have volunteered to help locate these projects in the blogosphere but they often get buried, so don’t hesitate to share. We will be very grateful for your assistance. Another feature I’m hoping to add to the blog is a monthly letter writing challenge. The positive response to the Compassion Correspondence Sponsor post and the tremendous outpouring of support (largely from teenagers) for the Valentines Day Card Challenge indicates to me that ministering through cards is a great opportunity for young people. PLEASE tell me if this is something you will be interested in participating in. My hope is to feature various missionaries, adopting families, and perhaps even organizations and orphans that we can send notes of encouragement to. If you know of a missionary working with orphans or a family in the adoption process, let me know! These biweekly posts offer you guys a chance to get involved right from the blog. Prayer and advocacy are two orphan care areas wide open to teens. Unfortunately, the prayer chains haven’t been getting many sign-ups, and that might be because you don’t quite understand how they’re supposed to work. Be on the lookout for a post explaining those a bit better. If you have a Gmail account, you may find some useful tips in this post about Using Google Calendar to Pray. (Don’t despair if you don’t have Gmail! Using the calendar to remind you to pray each day is absolutely not required for participating in the A&P prayer chains.) If there is something you don’t understand about the prayer chains or if you have ideas on how to improve the format of the A&P posts, PLEASE let me know. Knowing the ins and outs, the pros and cons of the orphan care and adoption worlds are a big part of getting involved in caring for orphans. However, it’s a little tricky determining which topics will be relevant and of interest to this demographic of readers. I am hoping to brainstorm and develop some helpful “learn more about this” posts to share with you guys. If you have any questions or would like to learn more about certain topics, PLEASE tell me. It would be so helpful to have some concrete ideas of what you all are interested in reading about. The Bible’s directives to serve the fatherless is the foundation of my passion in this area, and I know it’s the same for many of you. Therefore, I hope write a monthly post that draws it’s inspiration from God’s word. These posts may be specifically about orphan care, or they may be about broader topics that can apply to orphan care, such as the recent post titled, 120 Disciples Turned the World Upside-Down. If you have ideas for a devotional type post or would like to share how the Lord is working in your life in this area, PLEASE let me know and we’ll work on having you write a guest post. This blog only makes a pin-scratch in the vast resource of information, involvement opportunities, and inspiration shared by like-minded people. I would love to make a way for all of us to share our favorite orphan care related posts with one another each month. One of the blogs I follow is having a link-up party today. It would be awesome if we could share orphan care posts in a similar manner, so I’m doing some research on that potential (WordPress.com can be a pain about allowing stuff like that). So, that’s the “renewed” vision for TIO. I would love to hear your thoughts and ideas. Are these categories of interest to you? Which category is MOST important to you? Is there something not mentioned here that you would like to see on TIO? P.S. I did asked for feedback on a bunch of stuff in this post. You can share your feedback by commenting on this post (or any other post) or using the contact form. Oh really? If you know which organizations those are, I would love links to their websites! Having you guest post sounds like a great idea too. I’ll think about it and email you. Thanks for offering! http://www.heartsinunity.org/message.html On this website, you can send letters to orphans in Tanzania. I think there are more organizations too… I’ll get back to you on that. I would love to see the “Advocate and Pray” posts really take off. I think that we often (like almost always) underestimate the impact that sincere, intentional prayer can have. One thing that I think would be cool to see happen, would be to revisit some of the kids that we have prayed for in the past. That could give us an opportunity see what has happened to them, and to remind us to pray for them more long term than we have in the past. I would definitely participate in the letter writing activities! Oh. That would be great! Please do so and let me know the results.